Okay, so here I go obsessing over another game that is being released. This one isn't new, though, and I shouldn't really call myself a serious boardgamer if it isn't in my collection. 'Age of Steam' is considered one of the all-time greatest games invented and is ranked 12th on the geek. It has been out of print for at least four years and I have been watching random copies go for sale on Ebay for up to 200 dollars. Glad I waited. The new 3rd edition comes out this month for a hefty but reasonable 60 dollars. A simpler version of the game is currently available - a game called Railroad Tycoon which I have in my possession. I found Tycoon lacking, though, with a ridiculously large board and way too much luck. It was quite the disappointment as I had a feeling of just getting started with my strategy right when the game ended. Age of Steam should definitely make up for those shortcomings. Moreover, having introduced my partner and friends to Tycoon already should make explaining the rules to this one a little less painful. I'm sure you'll hear more from me once a copy is in my hot little hands. 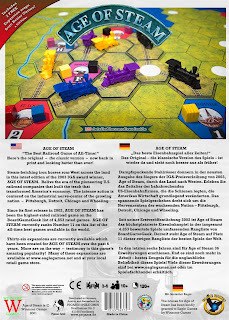 For more on Martin Wallace's masterpiece Age of Steam, check out http://www.boardgamegeek.com/boardgame/4098. Latest Dominion Strategy: Using the Throne Room to double the Workshop card to fatten your deck for the Gardens victory cards.